Read more of my reviews at Secrets of Lost Words.Rating: DThe Selection was one of my favorites last year and I'm sad to say that the Elite didn't live up to the first book.In the Elite, we get to find out more about Aspen and Maxon. You see America going between these two boys and just how undecisive she is in choosing which boy she likes. It's kind of annoying but also entertaining at the same time. 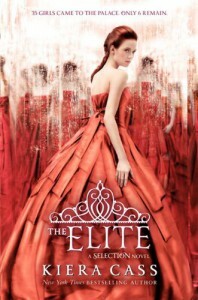 Due to certain things revealed in this book, I don't like or trust Maxon anymore. He seems like he's hiding something and that he might have an ulterior motive. So now, I'm all for Aspen! Woot!Despite sounding not all that excited about this book, it did have its good points. I think it all comes down to The One (the third book), where they finally end everything. Palace life is as always, the girls are always trying to cause each other's downfalls and compete in palace duties. There was a bit on the rebels and I wish we could have found out more about them.While reading this book, my mind was going everywhere so I didn't have much thought to take notes. Basically, I wish this book was better and it could have been better. Now, I'm just waiting on The One.